Harbor combines the thought leadership and insights of a think tank, the creativity of a designer and the growth strategy know-how of a start up. This paper identifies new forces acting on players and markets and seven key growth themes that tie closely to future OEM competitiveness which, in turn, are tied to several technology trends we believe will enable new customer solutions and new non-traditional growth opportunities. 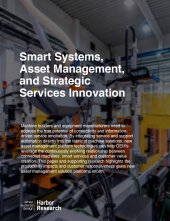 Of all the diverse trends in play that will impact OEMs, digitization and the continued evolution of Smart Systems technologies will impact virtually every dimension of any OEM’s growth strategy and operating model and will likely make the business look and feel very different in the coming years.